This comes from one of my all time favorite cookbooks. A really good friend told me about this book a year or so ago and I am so glad she did. The book is Artisan Bread in Five Minutes a Day by Jeff Hertzberg and Zoe Francois. I promise when you buy this book you will not be sorry. I have never made a good baguette until I made them from this book's recipe. That is the one I am giving here. So this is just a taste of what you can make from this very simple recipe. 6 1/2 cups unsifted, unbleached, all-purpose white flour, measured with scoop-and-sweep method. Place warm water into your stand mixer or large bowl add yeast and salt. Now mix in all of the flour. Kneading is not necessary. Yes, I said it is not NECESSARY!! I mixed mine until all the flour is mixed in really well. Now cover and let it rise for 2 hours at room temperature. After this break off two grapefruit size balls. Roll each of these into a 2 inch diameter rope shape and let rest for 20 minutes. Once the bread has rested paint it with water (this keeps the knife from sticking to bread)and slice small slits in bread. They say to bake on a baking stone with cornmeal sprinkled on it in but I don't have one so I used my silpat with cornmeal sprinkled on it placed on a cookie sheet. Worked fine. You do need to place a broiler pan on the bottom shelf in your oven and pour 1 cup of water in it right before you put your bread in. Preheat oven to 450' and bake for 20-25 minutes or until a deep golden brown. You will have dough left, just leave it in a covered bowl in your fridge. It will keep for a while. Around here it does not last but in your home maybe it will. I keep hearing about that book and I'm just intrigued by the "no kneading" bit - worth checking out by the sounds of it! 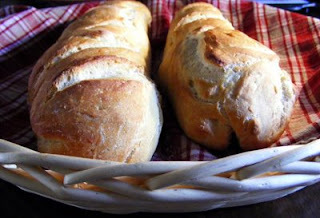 I never would have thought I could make bread without kneading but these recipes work GREAT!! Those baguettes were made without a pan too. I am just really pleased. Of course I will still be kneading my other recipes for bread.